If you don’t know what the Parallella is, go read their kickstarter page and come back. People have been talking about multicore for a long time. 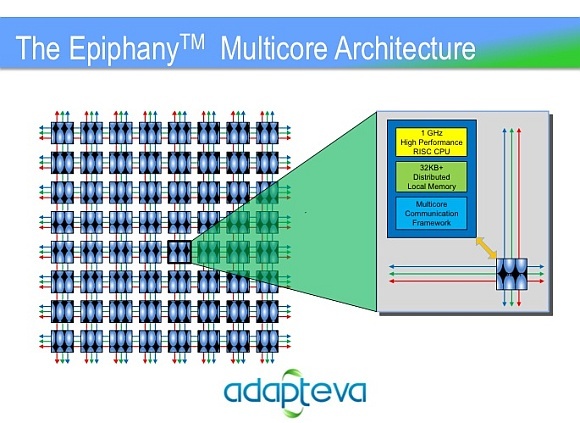 Every so often someone comes up with a novel architecture and they say that it’ll blow everything else out of the water Transputer, Connection Machine, SiCortex, XMOS, Tilera to name only a few. They are really cool, really nice ideas, you should read about them. But they are expensive and end up being used in niche applications, mostly as expensive toys until commodity hardware completely overtakes them or they run out of money. The reason people end up using desktop and mobile derived architectures is because they’re cheap and their price/performance and price/watt is often hard to match. Companies like Intel can afford to invest Billions in R&D, even if the architecture is clunky and ill suited to many applications, it still comes out ahead. A while ago I took a look at the Tilera platform, Tilera make a chip that looks a lot like the Epiphany-IV (this is the device they’ll make if they reach their 3million USD stretch goal), it’s called the TILEPro64, and is available today. The architecture of the Epiphany-IV and the TILEPro64 looks VERY similar (see the architecture diagrams below). I’d be surprised if there weren’t some patent fights over this in the future if either platform gets that far. They’re both mesh networked CPUs with limited on core memory, and you have to carefully optimise your code to keep the cores fed with data. In Tilera’s case I was unconvinced. I think they have a product that probably shows at most a 2 to 5x performance benefit over Intel at the same Wattage (for some applications) and costs more than 10 times as much. Development kits are also likely to be HUGELY expensive. In Tilera’s case my call was that if the unit cost was the same as Intel, and they showed a 10x performance benefit, they might have a chance. 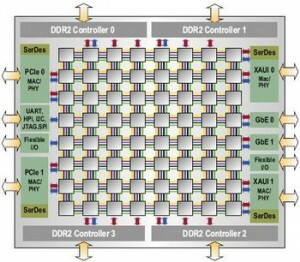 Even in this case I think it would be a hard slog to gain traction in the market, and it would be a constant fight as Intel and ARM licensees bring out new CPUs. So in Tilera’s case I felt they might find there way in to some high end routers, and will be used in a few HPC applications but eventually they’ll get left behind by commodity CPUs and disappear. 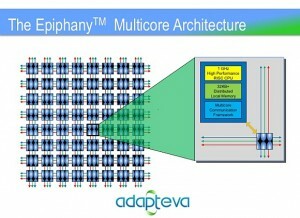 So can Adapteva pull it off, when a bunch of people have tried and failed in the past? I’m still pretty skeptical. I’d say you need to be 10 times faster than Intel (at the same cost or wattage) for people to take you seriously. The Epiphany-IV has several advantages over Tilera, the first is price. If you can really get the Epiphany-IV for 99 dollars in volume that’s pretty amazing. The second is that the Epiphany has hardware floating point, for many applications that’s an advantage too. The third is power, Adapteva talk about a 2 watt power consumption whereas the numbers I’ve heard for Tilera are more like 20 watts. With lower power consumption than the Tilera, it’s just about possible that they might hit the sweet spot and be 10times faster than Intel per watt. So I’m slightly more optimistic than I was about Tilera. However their current product, the Epiphany-III doesn’t look anything like as good. I don’t think that device will buy you very much over using commodity CPUs, it will however be an interesting toy and prime you for the release of the Epiphany IV. I wish them the best of luck, I think the Kickstarter project could give them some momentum. I’d love to see a affordable massively multicore CPU on the market. At the end of they day though, I still think our best bet will be Intel and ARM slowly iterating in this direction.